The Red Clawed Crab is a small species originating from Hong Kong, Singapore and Thailand. They are an aquatic species, however must have access to a dry area. What does a Red Clawed Crab look like? The Red Clawed Crab is a small species reaching a length of 4-5cm (1.5-2 inches). The crabs overall colouration is brown to grey with a cream underside. The pincer size and colour will determine if this is a male or female. Males have large bright red pincers compared to females that have much smaller dark red pincers. The tip of the pincer is a creamy yellow colouration. Where are Red Clawed Crabs from? They are found in large groups within damp holes along the mangrove river banks of Hong Kong, Singapore and Thailand. These are mainly brought over into the pet trade by fish importers, the Red Clawed Crab make a friendly addition to a tropical aquarium. How to you keep a Red Clawed Crab? Although the Red Clawed Crab is an aquatic species, a land area must be provided as this species required air from time to time. You will first require an aquarium with a secure lid; this is due to these crabs escaping with ease by climbing filter and heater wires. Housing a small group of five crabs would happily live in a 30inch aquarium. Males are territorial; therefore ensure only one male per enclosure is provide unless you have a larger tank an additional male can be added. An aquarium heater will be required and set between 24-29C (75-85F), do not allow this to exceed 29C (85F) as this can be fatal. Although some people have kept the Red Clawed Crabs in fresh water with no problems, long term we highly recommend brackish water. Use proper sea salt rather than plain table salt, 1 teaspoon per litre of water. The use of a light coloured sand or gravel will display the crabs better. Prepare your aquarium at least a week in advance otherwise you may find that you have cloudy water or dust floating on the surface from the sand. Provide bogwood, rocks, caves and other aquarium décor, the crabs will burrow and hide. Have some bogwood that sticks out of the water along with a small rocks or land area. You can use live plants; however these may be ripped up and eaten by the crabs. They should leave Java Fern alone, although each individual crab is different. The used of an aquarium filter will help keep your tank clean, along with air stones placed under the sand and rocks to oxygenate the water. Ensure you have a UVB light; this can be designed for fish or reptile keeping. These crabs are nocturnal but require 10-12 hours of daylight during summer and 8-10 hours during the winter months. As with most crab species, Red Clawed Crabs will feed on most foods. In the wild they would eat decaying plant matter, in captivity you can feed them peas, boiled spinach, cucumber, bloodworm (frozen or dried), shrimps, gammarus (dried crayfish), dried fish etc. If you do keep them with tropical fish, avoid any ground dwelling species or slow moving fish otherwise your crab may make a meal out of it. Some crabs may never touch the fish; others will attack any that get too close. 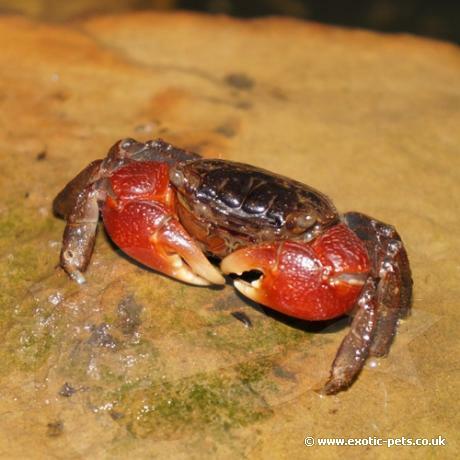 The Red Clawed Crab has been bred in captivity, although due to the difficulty in this, most crabs for sale will be wild collected. You can read the breeders report here.